The Impact of Landscaping on Resale Value - Executive Landscaping, Inc. When someone buys a home, they look at the immediate appearance, judging from what they see on that visit to decide whether or not they want to sign on the dotted line. And one of the things that naturally gets attention is the natural qualities it possesses – the landscaping. Admittedly, great landscaping doesn’t come cheap. It requires an investment, both of time and of money. But as any professional will tell you, the landscaping return on investment is well worth it in the buying and selling game. The better it looks, the more a buyer will be willing to pay. And if you’re a homeowner who was even ever-so-slightly swayed by that magical little thing called “curb appeal” or fell in love with what you saw in the backyard, you’re living proof that it’s a strategy that works. Certainly, there are things to consider before you invest a small fortune into landscaping features. 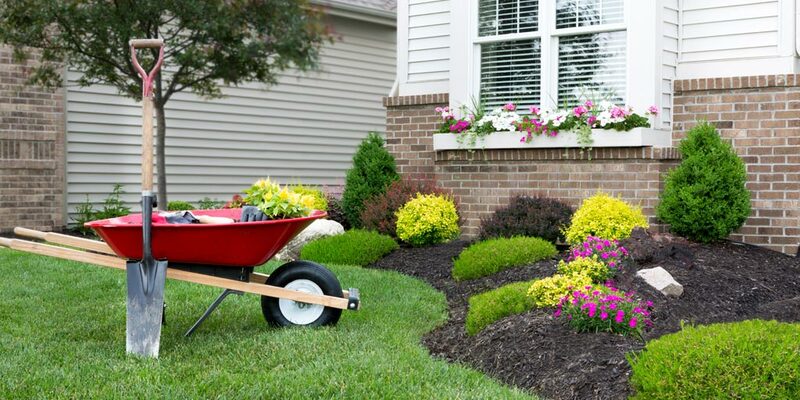 The landscaping return on investment theory only pays off if you don’t overspend or take things so over the top that all anyone sees is the money they’ll have to eventually spend on the upkeep. In other words, keep things in tune with the area you’re in, the demographic of the neighborhood and the style of the home. Don’t create English maze gardens replete with flowing fountains if your home is a simple bungalow in a middle-class subdivision; don’t install a million features that require careful maintenance and create high-energy costs. If you do, you’ll basically price yourself out of the market and regret that major bang you got for major bucks. The best plan to actually see a landscaping return on investment is to spend about ten percent of your home’s value on landscaping. Not ten percent in the front yard and ten percent in the backyard. Ten percent total. Generally speaking, not too much and not too little. Granted, not everyone has that amount of money in their budget, but it’s still important to do something to “pretty up” the property and make it appealing to buyers. At the very least, invest in some annuals, perennials or seasonal flowering shrubs that will add color and clean things up by mulching, edging and weeding. Tend to the turf, as well, so that it looks full and healthy. Unfortunately, there’s no hard and fast data on the actual landscaping return on investment you’ll see, in terms of dollar amount. Even so, the impact landscaping has is undeniable when a home hits the market. The better it looks on the outside, the more people will stop and want to tour the inside. At the very least, you’ll recover the investment you’ve made. In all likelihood, however, you’ll command a higher selling price than you would without that beautiful landscape – but again, that only holds true if you keep things attractive, but simple. Hiring a professional landscaping company to create a plan for your property is a wise move that often helps strike the right balance between just enough and over the top, so consult with a local team who knows the area well. At Executive Landscaping, Inc., we work with property owners all across the Gulf Coast with the goal of creating masterpieces that show a landscaping return on investment when they sell their home. We know the importance of natural appeal, and we offer solutions that fit their vision and their budget. Give the team of outdoor experts at Executive Landscaping, Inc. a call to learn more about how a landscaping return on investment is achievable for your property today!